The Council has prepared a template (word doc) specifying the background information required from each candidate for the open posts as Vice President. Closing date for nominations is according to the internal rules normally four months prior to the General Assembly in Christchurch. 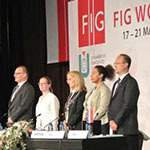 This call for bids is announced later than usually, and the FIG Council has decided to suspend the deadline until 20 January 2016. Nominations arriving after this date will not be considered for the elections. The General Assembly will normally further elect a Chair Elect for each of the ten FIG Commissions for term of office 1.1.2017-31.12.2018. Under normal circumstances the elected Chair Elect will be elected as the Chair of the Commission at the FIG Congress 2018 for the period 2019-2022. Please note that the General Assembly in 2015 appointed a Task Force to evaluate the current Commission structure and consider if any changes are needed. The Task Force will present their results at the 1st General Assembly 2 May in Christchurch, and there will be an opportunity for member associations to discuss and propose the future direction during the Working Week. The Task Force will summarise the comments at the 2nd General Assembly on 6 May. The final recommendation to effect changes or not will be included in the General Assembly agenda 2017 for voting. The recommendations of the Task Force on the Commission Structure and the decision of the General Assembly may or may not affect the number of commissions. Based on this on-going work, respectfully FIG Council has decided to postpone the election of Chair Elect for the 10 Commissions until the new structure has been settled or the current structure confirmed by the General Assembly. Voting for the period 2019 to 2022, for either structure scenario will take place in 2018 at the latest. We look forward to receiving your nomination for Vice President in due time prior to the deadline of 20 January 2016.